There are so many beautiful things for sale, each with their own story, that to condense a post into one subject is difficult. So I have a buffet of things today. Just click the picture or link to see more details about each item. 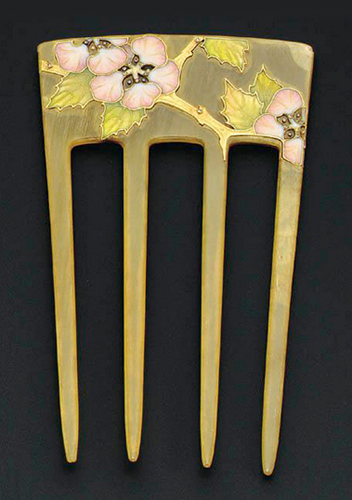 On 6 December 2002, this Henri Vever gold, enamel, and horn hair comb was estimated at $8,000 to $12,000, but did not sell. 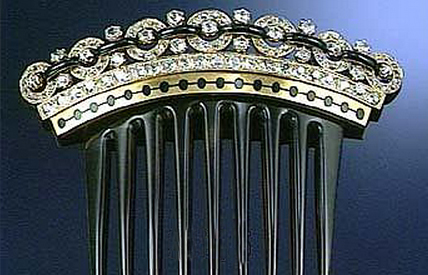 On 13 June 2000, this French gold, enamel, and diamond Eugenie comb, c. 1870, was estimated between 6,000 to 8,000 GBP, but also did not sell. 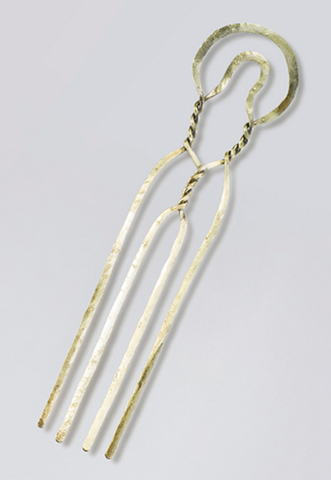 Up for auction on 14 November 2014 is this brass Alexander Calder hair pin, c. 1940 (Calder Foundation Archive number: A16974). Estimate $50,000 – $70,000. To me, this comb looks like a female body wired into a frame. The estimate is consistent with the Calder market, and I will be interested to know what it fetches. 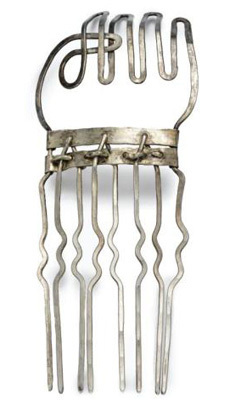 Will it appreciate in value, as did Calder’s silver “Figa” hair comb? 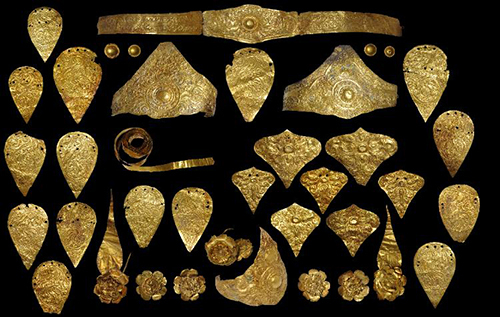 “Figa” in Slavic and Turkish cultures is a hand gesture made to represent male or female sexual organs. The first and second fingers wrap the thumb. It could be used in response to a money request or a plea for physical labor. In Ancient Rome, the gesture was used to ward off evil spirits. On 15 November 2006, it was purchased from the Whitney estate for $57,000. On 14 November 2013, that buyer sold it for 137,000. 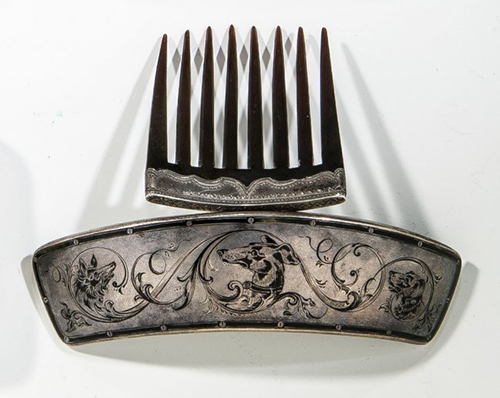 At Live Auctioneers, another comb caught my attention. It is Russian, c. 1908-1917, silver, and made by Fabergé work master Anders Michelson (marked AM). The comb has eight tortoiseshell prongs and a beautiful hinge that fits over the entire top. Michelson used niello, a black mixture of copper, silver, and lead sulphides, to inlay the dogs and floral pattern on the tiara. The auction starts on 13 November 2014, and the opening bid is €300. Michael Backman Ltd. is selling a pair of gold and gilded silver-filigree dragon hair pins from China’s Qianlong Period (1735-1796). They have dragon heads, each of which have a turquoise cabochon. Openwork hair ornaments were known as “tongzan” and were worn from the Ming Dynasty onwards. Also on sale is this comb from the Solomon Islands. It is a faa, or man’s woven comb from the Kwaio People, Malaita, Solomon Islands. 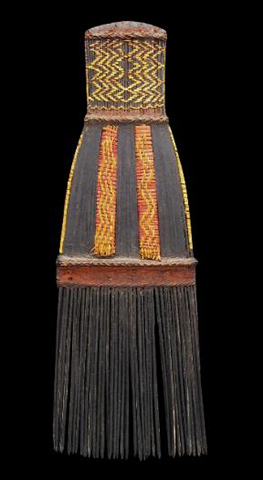 Woven from yellow-orchid and coconut-palm-frond fibres, the comb was dyed with the geru root. Its teeth are made of fern wood. There are 6 bids on it, including 2 experienced bidders. It’s real tortoiseshell. As of this printing, there are 3 days and 11 hours to go on this auction. The seller thinks it’s French. It could be French or Edwardian English because jewelers in both countries made these types of pins. The auction has 4 days to go. It is rare, it is real, and I’d get my hands on it if I could. Choosing one amongst many beautiful things is so difficult. Mustn’t we just have them all.